Makota Valdina Pinto is an ethicist, environmental justice activist and an elder inthe Congo-Angola tradition of the Afro-Brazilian religion, Candomblé. Ms. Pinto is also a specialist in the ritual pharmacology of the Afro-Indigenous religious traditions of northeastern Brazil. She travels widely – throughout Brazil and internationally – as an eloquent and esteemed spokesperson for devotees of African based religious traditions. Ms. Pinto has received numerous honors and recognitions for her work, including a “Grassroots Wisdom Master” award from the Gregorio Mattos Foundation of Brazil, the Clementina de Jesus Trophy and the Maria Quiteria Medal awarded by the Salvador, Bahia city council. Antonio dos Santos Cerqueira Junior (aka Junior Pakapym) is a digital artist and painter whose work draws on the rich iconography of Afro-Brazilian religious and cultural imagery. Mr. Cerqueira is a Candomblé initiate and member of a family with a longstanding tradition of racial and environmental justice advocacy. His art has been the basis for posters, banners and pamphlet covers related to grassroots organizing efforts in Salvador, Bahia, Brazil. As a millennial, Junior represents a generation of young Afro-Brazilian artists who are approaching ancestral traditions of ritual art with the tools and sensibilities of anime, graphic art and contemporary digital modes. Daniel Minter is an award-winning, Maine-based painter, sculptor, illustrator and assemblage artist whose work is profoundly influenced by his roots in southern African American culture and his decades of exploration of artistic and religious traditions of the African diaspora. Minter’s work has been exhibited both nationally and internationally at galleries and museums, including the Seattle Art Museum, Tacoma Art Museum, Bates College, Hammonds House Museum, Soren Christensen, Northwest African American Art Museum, Museu Jorge Amado and the Meridian International Center. In 2004 and 2011, Minter was commissioned to design the Kwanzaa stamps for the US Postal service. Makota Valdina Pinto (see description above) will be joined by Louise Wakerakatse Herne, a Clan Mother of the Mohawk Longhouse of Akwesasne. Ms. Herne, is a respected ceremonial leader, counselor and community organizer responsible for protecting and passing on traditional spiritual and cultural teachings. She is also an activist whose work combines organizing for environmental and gender justice and advocating for the rights of indigenous people in North America. Drawing on resources and rituals from indigenous Afro-Latin, African American and South Asian traditions, this workshop encourages participants to apprehend healing in its broadest connotations – as both personal and societal/environmental; physical and psychological; material and spiritual. The workshop offers approaches that acknowledge the sacred feminine in various forms – particularly in aspects of the natural world like water, wind and earth. Workshop facilitators, Gloria Rodriguez, Lakshmi Nair and Rachel Harding share activities with participants that include physical movement that balances our energies (dance and yoga), guided meditation, plant wisdom from Candomblé and southern African American traditions, theater and intergenerational storytelling. Gloria Rodriguez is a psychologist, workshop facilitator and tenured professor at Bronx Community College in New York. She is also an initiate in the Yoruba/Lucumi religious tradition and director of DeAlmas Women’s Institute. She specializes in developing seminars and workshops focused in Afro-Indigenous spirituality and social justice advocacy. Lakshmi Nair is a 4th-generation yogi and founder of the Satya Yoga Teacher Training Program in Denver. Ms. Nair teaches yoga not primarily as a form of physical exercise but as a resource for activism and healing. Satya Yoga is one of the nation’s first yoga teacher certification programs designed specifically for people of color who are committed to teaching yoga in Black, Latinx, Asian and Native communities. Rachel Harding is the Sterling Brown visiting professor at Williams. She is also co-director of the Veterans of Hope Project where she regularly develops workshops at the intersection of a spirituality of compassion and social justice activism. 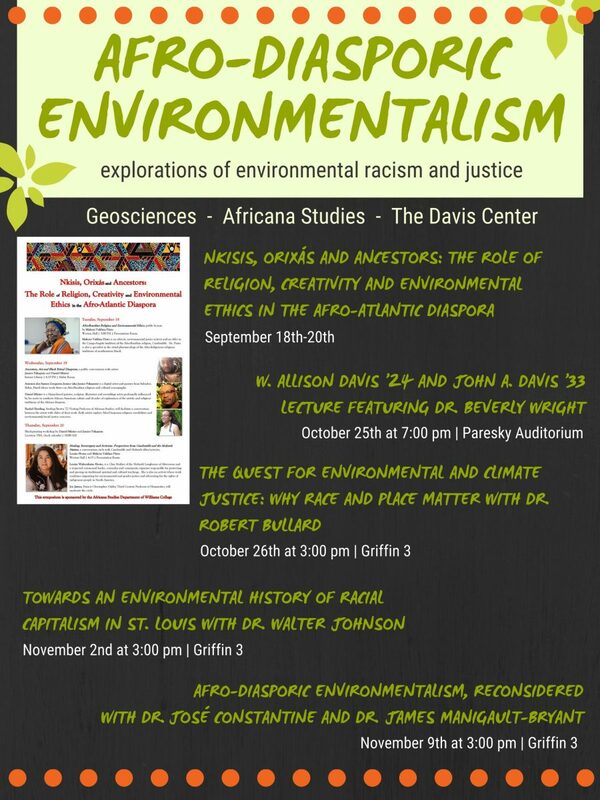 Professors José Constantine and James Manigault-Bryant will consider the numerous insights and wisdoms gained from the fall lecture series on “Afro-diasporic Environmentalism: Explorations of environmental racism and justice.” The series has included talks by Drs. Robert Bullard, Beverly Wright, and Walter Johnson, as well as a symposium on the Role of Religion, Creativity and Environmental Ethics in the Afro-Atlantic Diaspora. José Constantine is Assistant Professor of Geosciences. James Manigault-Bryant is Associate Professor of Africana Studies. 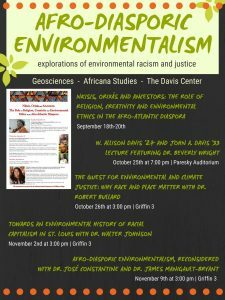 Sponsored by Africana Studies, Geosciences, and the Davis Center.